Private little paradise in paradise island. Beautiful location beside rice fields,gorgeous garden,nice pool,comfy relaxation area. Spacious,very comfortable and clean villa. Smiley staff were always ready to help thanks Ketut and others. Good breakfast. good wifi Special thanks to Kari,our driver/guide in Bali. The villa is situated in the middle of beautiful nature and away from mass tourism. We had a lot of space and our kids could be free and enjoyed pool, garden and games at the villa. We adults had a very relaxing time and enjoyed reading (there were a lot of books in the villa) strolling around and just hanging up in the beautiful garden. The staff was very friendly and helpful and connected so well with our kids too. Such friendly staff, amazing hot stone massage, such luxury in quiet countryside surroundings. One of the best places to stay in Bali. Everything was perfect. Very clean, good location and soo quiet.. Amazing massage and breakfast. I will definitely come back! Privat beautiful house with wonderful garden and pool Two great hostesses (Nyoman and Ktut!!) who made us superb meals and breakfast! Walking distance to the sea Two very large bedrooms Very safe and remote location We stayed here for 3 nights but could have spend 10 easily. We used local public transportation minibuses for trips to eg Balian Beach. Nice host Suli. Women in the kitchen make great breakfast. She arrange massage and make dinner also. A lot of fun for children (rumikub, cards UNO etc). Nice pool. There is close to the villa restaurant. Very private, clean and relaxed. The beds were very comfortable. The bathrooms were really nice. The staff was very friendly, kind and helpful. They got us a cake to celebrate our daughter’s birthday. Too bad we have had only 3 nights here.... we would love to come back here. Lock in a great price for Villa Gede Batulumbang – rated 9.8 by recent guests! Villa Gede Batulumbang This rating is a reflection of how the property compares to the industry standard when it comes to price, facilities and services available. It's based on a self-evaluation by the property. Use this rating to help choose your stay! One of our best sellers in Selemadeg! Set in Antasari in the Bali Region, this semi-detached villa features a garden with an outdoor pool and a sun terrace. The property features views of the mountain and is 19 mi from Kuta. There is a dining area and a kitchen complete with an oven and a toaster. Towels and bed linen are offered in this self-catering accommodations. Ubud is 19 mi from Villa Gede Batulumbang, while Seminyak is 17 mi from the property. The nearest airport is Ngurah Rai International Airport, 19 mi from the property. When would you like to stay at Villa Gede Batulumbang? This villa has a dining area and a fully-equipped kitchen with an oven. Villa gede is located on the west coast of Bali 2 hours away from the hustle and bustle of Kuta and Denpasar The villa has 2 bedrooms,each with a double bed, plus two single day lounges which can be used for additional guests. The villa also has a traditional Balinese lodging located in the garden, it has a double bed and open roof shower and toilet. Wifi internet, TV and DVD player are available at the villa. This type of holiday accomodation would suit the holiday maker preferring a quiet and relaxing alternative to the well known tourist areas. Villa Gede is the ideal haven for the yoga enthusiast and those looking for a memorable get away. 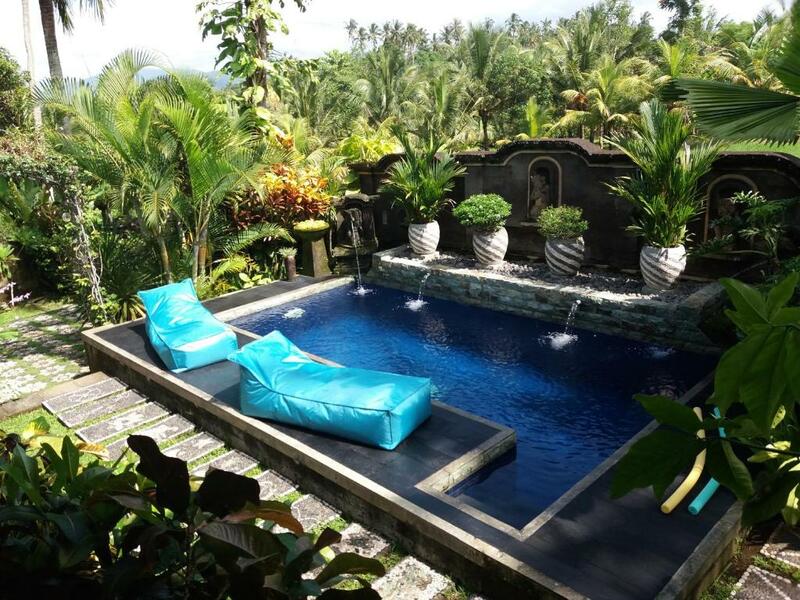 It is located close to the popular Balian Surf Beach taking approximately 10 minutes by motorbike or car. 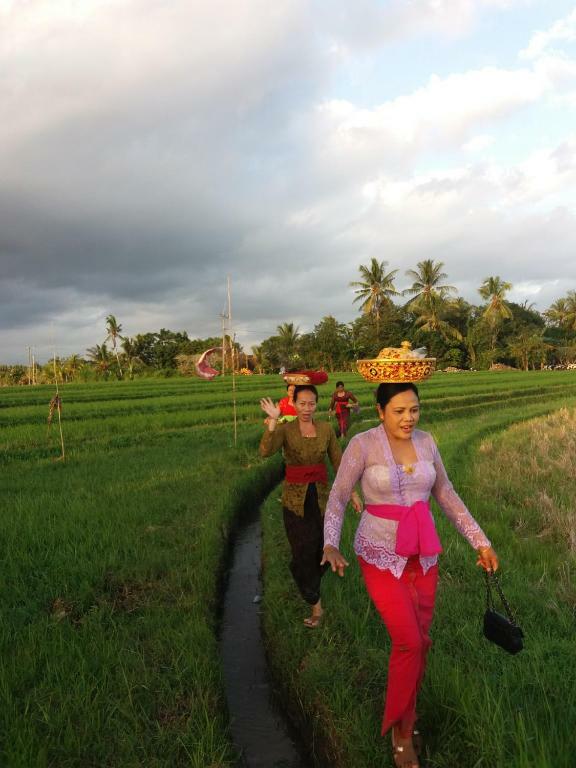 I am a Balinese lady living with my family in the village of Batulumbang on the west coast of Bali. I have a good local knowledge and experience with western guests from many countries. It is in a great position to explore the local area with its rich culture and the colourful heritage of local villagers. The villa has Balinese housekeeping staff who take care of the comfort of guests. Breakfast is included in the room rate, other meals and laundry can be arranged through negotiation with Nyoman and Ketut. The staff will also help with all your needs from massage to rental car with or without driver and / or motorbike. The villa is within the village of Batulumbang in the regency of Tabanan. The village people are very welcoming and understand the importance of tourism to Bali. Local eating places are within walking distance but transport is required for numerous restaurants a short drive away. Selfdrive rental vehicles can be arranged but reliable local drivers are available. House Rules Villa Gede Batulumbang takes special requests – add in the next step! Villa Gede Batulumbang accepts these cards and reserves the right to temporarily hold an amount prior to arrival. Please note that the property is located in a very quiet area. Guests should be aware that the villa has levels that can only be accessed by steep stairs. Please inform Villa Gede Batulumbang of your expected arrival time in advance. You can use the Special Requests box when booking, or contact the property directly using the contact details in your confirmation. Quite a lot of traffic on the main road near the villa, walking along the road very difficult. In the Darkness the walking path from the Main Road to Villa was a bit dark . The Villa was perfect with amazing staff but the Location selemadeg is very quiet and due to heavy traffic on the Highway doing anything else in Bali will keep u 2 hours on Road one -side. Highly recommended for peace loving folks like my Family but may not be suitable if u want to explore whole of Bali as u will feel like stuck on a beautiful island and it will add cost and time to visit any other place. I will love to stay in this place again . The see is not far away, but wild, not so good and safe for swimming. The beach is rough and we wouldn't recommend to go swimming. But nevertheless our kids enjoyed building sand castles and looking for crabs and sea shells a lot. Everything, it was just perfect! Everything was good! The host, Suli, is very kind to welcome you. The villa was like a dream, open to the nature and zen attitude. Don't miss the breakfast and dinner cooked by Ketut and Nyoman, 2 wonderful people who make the villa like your home, they are very friendly! None of the following are actually negatives just a friendly tip from one traveller to the next. The property is quite isolated, and a trip to the market is difficult with kids (but also a great experiance). The only alcohol ANYWHERE close by is bintang. Had we known this we would have stocked up on the way there. Breakfast is included in the cost and you can have lunch and dinner made each day at an arranged cost. Between the ladies and the local warungs you won't go hungry. But we like to cook too, so next time we will come much more prepaired. Being so surrounded by nature, you get all things that go along with that, bugs, lizzards, frogs and all sorts. The day we arrived I noticed lots of huge bee/wasp type things and I was initially terrified but soon noticed the bugs in Bali are just like the people. Soooo chill. There are many but if you don't bother them they sure won't bother you. We soon enough were just hanging out with all the windows open and even overhear my five year old (who was initially terrified too) telling our one year old 'it's ok just move away they won't hurt you, this is just part of nature.' There are no air cons but it's really not a problem. There are only 4 or so really hot hours where we just hung out in the pool or had a nap and then the temperature before, after and through the night is quite comfotable. The fans in all rooms and even outside are enough. I really can't fault this place, we fell in love and will be back again for sure! We were greeted on arrival by staff, who are absolutely amazing. Suli, Nyoman and Katut are gems and we miss them on the rest of our trip. If I were the owner I'd be very proud to have these wonderful ladies as an asset to the property. The huge property is in an absolutely beautiful setting,and well maintained. Surrounded by rice fields, lush jungle greenery and fresh fruit at your fingertips. the young green coconuts and green passionfruit are to die for. We were lucky enough to have some bananas become ready while we're there too. Katut and Nyoman, come and whip up a simple but amazing fresh breakfast, and swifty clean the property and grounds without any awkward interference like in some other places. I had a spill with my one year old who had a bad bump to the head, within minutes Suli was on the phone to the doctor who is actually located right on the same street. My daughter and I enjoyed searching for the many many lizzards, butterflies, caterpillars and frogs. The whole surrounding community is so friendly and welcoming, especially the girls at the local shop just a short walk past the end of the street. If you have small children like we do be prepared to pass them around, our kids adored them. AND they deliver Bintang and put it straight in the fridge. Also at the very end of the street there is an outstanding little warung, don't let the small menu fool you, the food was so fresh and delicious and had a gorgeous view. Also a really cool little platform in the trees you can go and sit upon (if you don't have a one year old who would just walk off of it) There are other warungs further down the main road on either sides, but you will need a driver or a scooter so you don't become the next 'crazy white family' walking along the main road/highway HAHA The beach with GORGEOUS black glittery sand and really pretty, really warm rock pools are alive with small fish crabs and star fish is only a short stroll down the street. The beds were comfy. The shower was hot. The facilities outside were lovely.